Which is the best solar oven? This oven is considered the Cadillac of solar ovens; and for good reason. 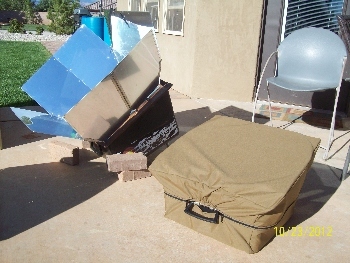 The AASO is probably the highest quality of all of the solar ovens in regards to materials used in its manufacture. Only the Hot Pot and SolSource are comparable but, are different styles of solar cookers. 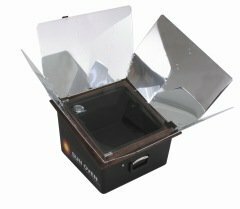 The AASO is the hottest solar oven, on average, of all of the major manufactured brands, although this can have it's drawbacks at times, but mostly this is a plus. The higher overall temps make it especially good for baking cookies, breads, cakes, pies etc. I like the fact that the lid (door) is made of tempered glass and is easy to see through and keep clean; and it rarely gets scratches. I also like the metal hinges on the door which make it easy and convenient to access the oven chamber when placing or retrieving foods. I like the built in leveling leg that allows for greater oven angles, thus capturing more of the suns rays in wintertime and early or late in the day. I like the leveling tray (shelf) inside the AASO that maintains the pot and food level, thus avoiding spillage. I like the durable outer casing of the oven also; very scratch resistant and break resistant. I also very much like the large sized polished aluminum reflector panels on the oven which give the AASO much of its heating potency. I like the fact that they are attached to the oven and also collapsible, making it easy to store when finished. Since the panels are made of polished aluminum they are easier to clean and they will not fade like Mylar or other reflective materials do over time. The insulation of the AASO is excellent, allowing for higher cooking temperatures and greater heat retention during the cooking process; and afterwards when maintaining food hot or warm for several hours before eating. I like the idea of the carrying handle and the reflector panel securing strap, making the oven like unto a suitcase; making for easy transportation. The oven is also light enough for any one to carry about with ease. The thermometer is attached to the oven, keeping it from always tipping over or losing it. The AASO is one of the easiest ovens to clean and its interior has a more durable coating or finish that make it easy to clean up and more scratch resistant. The Sun Oven can cook a larger quantities using the oval shaped mid-size turkey roaster placed inside the oven on an angle. 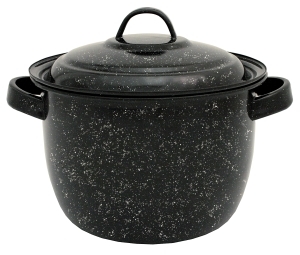 The oval roaster pan allows for easier fitting inside the oven. ...Do these things make it the best solar oven? The inner compartment, or cooking area is too narrow for many regular sized cake pans, cookie sheets etc. But, the All American Sun Oven is the deepest of the commercial solar cookers which make it nice for cooking large hams or medium sized turkeys when the leveling tray is removed. You can find smaller cake pans and cookie sheets though, that will fit the AASO; if you look around enough, and you can double stack (tier stack) smaller sheets and pans in the deeper AASO oven for more cooking capacity. I have had to be very careful when cooking with the leveling tray in the AASO, and while placing or retrieving items because it has a tendency to move and cause your pans to tip. The wood trim on the Sun Oven looks nice, but does require regular maintenance by applying oil to keep it from fading and cracking, but this is easily accomplished. The metal casing for the leg has become slack and does not hold the leg in position very well, in fact it will collapse suddenly because it has little of the peg notch to firmly hold it. With all that having been said, I very much like my All American Sun Oven, and like some AASO owners, I plan on using it for the next twenty years.